Grafton – Genevieve T. (Murray) Mahassel, 83. Gege was born in New Bedford, but her parents and seven siblings relocated to Grafton when she was young. Grafton is where she spent most of her life and was engaged in town politics and community events. Gege always brightened up the room with her quick wit, irreverent sense of humor, and her smiling Irish eyes. She was feisty, energetic, and fearless. Her mother’s attempt at a Catholic school upbringing was not meant to be; Gege had the biggest twinkle of mischief in her eye when talking about the time she grabbed the ruler the nun was trying to hit her with and turned it back on the nun. She set an example as an advocate for herself and the less fortunate, and after graduation spent time in New York and Florida before returning to her roots in Grafton for a career in advertising. Gege married the love of her life, George, on July 5, 1970. Together they raised two children, and during her time as an at-home mom she began to pursue her passion for antiques. She loved finding treasures, restoring and repairing them, and selling them in “The Little Shop,” a small business they eventually opened behind their home. She also found much joy traveling New England with George to set up booths at antique shows, where they made many friends. Gege instilled the importance of education, civic duty, traveling, and enjoying life to the fullest in their children. She loved gardening, cooking, and decorating with her antiques. She was proud to serve as president of the Grafton Historical Society and organized their annual Antiques Show fundraiser on the Common several times. She was loved and cared for by the compassionate staff at Beaumont Northboro during her final years, and will be remembered as a loving mother, sister, wife, aunt, grandmother, and friend. Gege was predeceased by her husband Oct. 2 and we believe she wanted to be with him for Christmas. 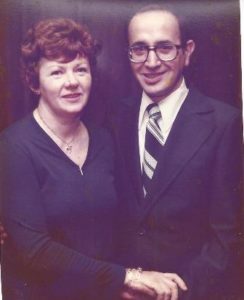 She was also predeceased by sisters Rose, Margaret, and Theresa, and brothers Louis and Walter Jr. She leaves behind her older sister, Helena Gallerani of Dennis; younger sister Frances Maino of Worcester; daughter Maria and her husband David; son George Jr. and his wife Ami; four grandchildren; and many beloved nieces and nephews. Calling hours will be Saturday, Dec. 23, from 11 a.m. to 12 p.m., at St. George Orthodox Cathedral, 30 Anna St., Worcester, with a funeral service immediately following at 12 p.m. Graveside service will be at Hope Cemetery after the funeral. In lieu of flowers, we hope you will consider a donation in her memory to the Alzheimer’s Association, 309 Waverly Oaks Rd., Waltham, MA 02452, or St. George Orthodox Cathedral, 30 Anna St., Worcester, MA 01604.